Umbrella Strollers – The Must Have! Little Tikes Baby And Bath Toys For Your Baby! Baby acne is a common disorder among the newborn and you can tackle the problem following one of the suitable baby acne treatments. Baby acne medically termed as Neonatorum usually occurs to babies at the age of four weeks and may prolong up to six months or more. This is not a dangerous problem but as a new parent, you may be scared because of lack of information on the subject. Of course, you do not want your dear little one to suffer but being patient is more important to treat your baby. It is also important to keep your baby calm because the problem of acne gets more aggravated when the child is fussy or annoyed. There may be many reasons for an acne breakout in adults. However, the main reason for the occurrence of acne in babies is considered as the hormones transferred from the mother during the time of birth. The sebaceous glands also known as oil glands get stimulated due to these hormones and produces excess sebum. This leads to pimple like structures on the skin of the baby that causes severe itching and irritation. Apart from this, the other reasons may be due to the medication that the baby might be undergoing. Sometimes, if the mother is under any medication especially if she is nursing it can affect the baby. Just by following some simple baby acne treatments, you can help your baby feel comfortable. 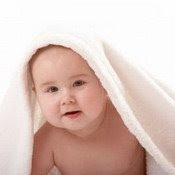 Generally, baby acne does not require any treatment. It will be gone once the hormones acquired from the mother work out their way out of the baby's system. Nevertheless, in order to provide some relief to the child you can follow some simple home remedies. Give the baby a mild wash once or twice a day. You have to always ensure to keep clean the surroundings and things that are exposed to the baby. Remember to wash the clothes with a mild detergent. Harsh soaps, detergents and rough clothes will worsen the acne problem. After every meal or spit up, gently wipe the face of the baby. The baby's skin is tender and hence it should be always handled very gently. In spite of the above home remedies, if the problem persists then you have to consult a pediatrician. Baby acne treatments recommended by child specialists will effectively solve the problem. Some of them recommend hydrocortisone cream which is an over the counter drug in order to treat this condition. However, an OTC like ionic colloidal silver solution kills the baby acne causing bacteria more effectively than any other drug. It is also relatively safe and gives instant relief to the itching. Some people claim that a vinegar solution works best for a baby. We can find many products in the market that contain vinegar solution. However, before using any product you have to test it by applying a small amount on the baby's skin in order to ensure that is does not have a bad reaction to the tender skin. Always remember to follow strictly the advice of a medical practitioner in case of baby's ailments. Avoid using an OTC drug on the baby without a doctor's prescription. Never ever, try any other medications of teenage acne on the baby's sensitive skin. Follow one of the baby acne treatments along with some proper care the acne problem can be easily alleviated and you can see your baby smiling. Powered by Blogger. Design by Bob y Zona Cerebral. Copyright © 2008.